I know this book has been recommended to me before. By several people in fact. I just can't remember who it was that recommended it or when. At any rate, I finally got around to reading it. As mentioned previously, Sara Nelson briefly mentioned this story in her own book, So Many Books, So Little Time. Given the fact that she thought so little of it that she mentioned it only in passing, I had high hopes for a good story. I was not disappointed. I, like Ani, had a hard time classifying this book. Before writing a review of it I decided to do a little research on Enger and stumbled across an interview he gave on this work. You can read that here. Interestingly enough, Enger would put his work in the "western" category. I'm not entirely sure I would agree - but hey - he's the author. If anything, I find it a haunting western, perhaps because its set in North Dakota and having heard enough tales of ND from Julie's visits there it just seems like a haunting place and thus befitting of such a story. Truthfully, I almost stopped reading the book by about chapter three. The story begins with the Land family in a precarious position being threatened by two teenage boys who had less than sterling moral standards. To put it bluntly - I was a bit creeped out. After my first day of reading I had to ask Jonathan to pray over my dreams that night (because I knew I'd be dreaming about the story). He asked what I was reading. I paused. 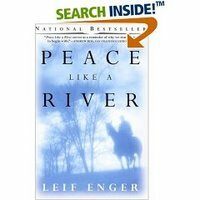 "Peace Like a River?" I replied. He burst out laughing. I only decided to continue reading when the teenager boys were done away with by Rueben Land's brother, Davy. (I hesitate to say too much about the story precisely because I think its a worthy read and therefore don't really wish to give away much of the plot at all.) Peace returned when the boys were gone! Enger makes his characters so real that its hard to believe that this isn't a true story. It could very well be. His characters struggle with belief in God, miracles and their own sinful natures. Enger professes to be a Christian but doesn't seem too eager to put his readers on notice of that fact. It's a clean tale (although it starts out in a spooky fashion) with a heavy emphasis on Reuben's father's faith. You know that the father figure is a strong Christian but you don't know whether the author himself is. One thing that really struck me about this book was the timely entry of two additional and essential characters to the plot. Just when you start getting a little tired with the immediate Land family, a new character is introduced into their midst and her personality keeps the story moving along. By the time you get used to her being around, the final main character is introduced. I've never noticed that in most stories. They just sort of flow along. This story flowed, but it really needed the two last main characters or it would not have worked so well. Enger says in his interview that he would read the scenes he had written to his family and gauge the success of his story on their interaction. All I can say is - his family has good taste in timing. In short, I'd say go grab a copy of this book and give it a read. Force yourself past the first few chapters and I'd bet you won't be disappointed. I'd be very curious to hear what others who have read the book have to say about it.